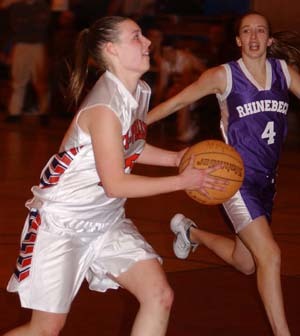 TRI-VALLEY GUARD Nikki Dean drives past Rhinebecks Maggie OMalley during a game this past season. Team Leaders: Senior guard Amanda Krom was the Lady Bears top scorer. She averaged 8.64 points per game. Krom also lead the squad in three-point baskets, sinking 39 of them during the season. At the recent team banquet, Krom was named one of the Lady Bears two MVPs. She was also named to the all-Section IX girls basketball team, which is selected by the sections coaches. The other Lady Bear MVP was junior center Lacey Moore. She averaged 8.5 points and 13.45 rebounds per contest. Moore set a team record for rebounds in a season, grabbing 296 boards. In one particular contest, Moore garnered 30 rebounds. She also paced the Lady Bears in blocked shots, recording 24 in the 2003-2004 campaign. Also at that team banquet, junior guard Shauna Murry was presented with the Most Improved Player (MIP) award. She grabbed 102 rebounds this season and scored just over eight points a game. Junior guard Melissa Bachmann was the team leader in assists (63) and steals (95). Season Highlight(s): Winning our first round sectional game against Rhinebeck, Coach Karen Furman said. In that Class C contest, which was played on March 1 in Grahamsville, Krom and Moore each netted 14 points to lead the Lady Bears to a 51-46 victory. Furman noted that another highlight was how the team played against Division V foe Tuxedo in a February contest. We played Tuxedo here and we played very well, she said. We went into halftime with a lead and the girls were competing well. Season Lowlight: Furman noted that the team really didnt have a lowlight. Other: The Lady Bears will lose two players  Krom and Jessica Lake  to graduation.